AuPairWorld's Annual Report for 2012 provides the key figures of the past year's positive developments and foresees the prospect for continued strong growth in 2013. AuPairWorld provides an innovative platform that gives au pairs and host families from around the world the possibility to connect with each other and establish au pair relationships. Recognised as the world’s leading Internet-based au pair placement service, AuPairWorld currently has 24 employees and is operated by a.n.d. Internet Services GmbH & Co. KG, based in Kassel, Germany. The AuPairWorld Annual Report is divided in two sections - Business Development 2012 and Business Outlook 2013. 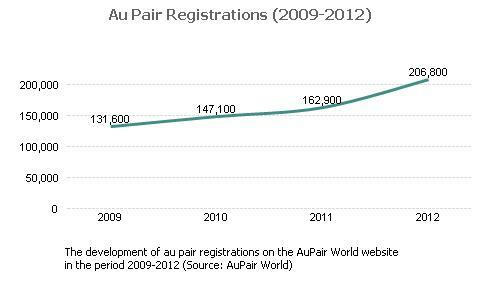 AuPairWorld continued to experience exceptional growth in 2012. In both of the two main user groups of the web portal - au pairs and host families - there were significant increases in use as tracked by new registrations. A total of 206,800 au pairs registered on the site in 2012, an increase of more than 25% over 2011 and a continuation of double digit growth figures from 2010 and 2011. The site is clearly continuing to gain popularity among young people as is the au pair experience itself. 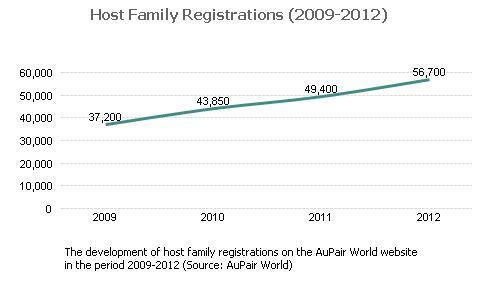 The bar graphs below show the development in au pair registrations by au pair nationality in the period 2009 – 2012. Strongs rates of growth were seen in the past year in many European countries, demonstrating a growing interest in au pairing as an attractive option for young people. Also of note is the upward trend in use of AuPairWorld by au pairs from the United States, which saw a growth rate of more than 30% to some 7,600 registered au pairs. Uwe Regenbogen, founder and co-director of AuPairWorld, sees a striking endorsement of the au pair option for young people in these developments. "What young people seem to be recognising is that the au pair experience offers a distinctive opportunity for their personal development," he observes. "That means having the chance to perfect their skills in a second language, it means learning how to manage things in another culture, and of course it means taking on responsibility in a new family. All in all, it's a very direct and immediate way to develop and demonstrate key skills for their later careers, and at the same time it's exciting and enjoyable and challenging." Spain was the clear leader in au pair registrations in 2012, but young people from France, Germany, Italy and Great Britain also continued to make substantial and growing use of the AuPairWorld platform. The predominant au pair users of the system continue to come from European countries, where international mobility and global integration seem to be an ever stronger trend. 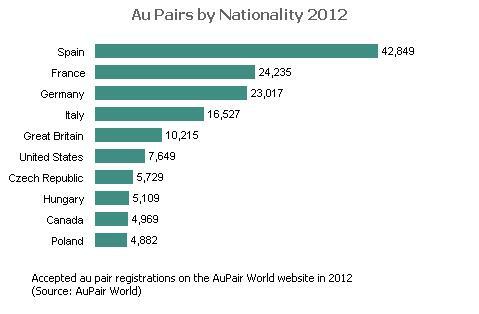 The bar graph above shows the breakdown for au pair registrations at AuPairWorld among the top 10 countries for 2012. The top six host countries making use of the AuPairWorld platform are located in Europe. In all of the ten leading countries, there was a common trend of continuing growth in 2012, at rates ranging from 36% in Australia to 5% in Germany. The bar graphs below show the development in host family registrations on the basis of host family country in the period 2009 - 2012. 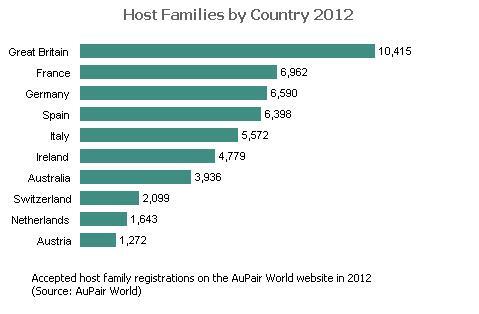 The graph below shows the breakdown among the top 10 host family countries for 2012. Great Britain led the pack followed by Germany, France and Spain, which all figured as major host family users of the AuPairWorld platform. There was substantial and growing availability of English-speaking host families (of interest to many au pairs), with the large number of registered host families from Great Britain, and strong host family growth coming in both Ireland and Australia. The figures presented here were obtained from AuPairWorld's internal statistics system on 3 May 2013.